The three princes found themselves surrounded by untold treasures left abandoned in the castle. The King’s prophecy seemed to be true, barely a treasure had been spoken for by the Princes or the Princess. It was then an Angel appeared amongst them (hey…I’ve heard this story before!). She spoke not a word. She seemed to float, yet not. Light surrounded her. Upon her robes there was writing. An ancient text; given the date written after the words. As luck would have it, the bride of one of the Princes knew the ancient language. The fair maid, translated the words: “The Family of Sayre”. The middle Prince, and most handsome (hey, it’s my freakin’ blog, you other two can write your own blog if you want to be the most handsome!) immediately sent word to the head of the Family of Sayre to join them at the castle. There were a handful of trinkets representing the Holy Days, surely the Family of Sayre would find use for them during the upcoming Season. When Larry of Sayre arrived, the Princes bestowed upon him a dozen or more trinkets. Being an old and dear friend of the King and very well known to the Princes, they took to telling stories from the ancient of days and more recent news from the Family of Sayre. They were acquiring a second castle in the southern part of the kingdom. A place for their family to rest and to feast. A place for his Princess and Prince to bring their offspring and frolick in the spiritual waters. Now, I don’t recall who thought of it first, I believe it was the handsome middle Prince (again, it’s my damn blog! ), “Don’t you need some fine furnishings for this new castle? Perhaps, a bed upon which to rest after a day of chasing the fox with the hounds? Perhaps a dresser to store your robe and garments? Perhaps a lounge upon which to look out across the kingdom?” Perhaps, a rack in which to store your pages? Perhaps a roll of paper with the King’s seal? Larry of Sayre was overcome. Yes, he would be honored to take use of the King’s things. He called upon more of the Family of Sayre to bring their wagons, they would fill them with their good fortune. Wagon load, after wagon load of treasures were taken to the the Castle by the Water. Soon, the King’s Castle had but a few items left. The Princes were pleased, they knew the King would be pleased. Not only were his things taken, they were taken by the Family of Sayre. That evening there was rejoicing throughout the land. Ok, enough with the Fairy Tale…I could not resist! As the actual events described allegorically in the tale unfolded, the word “serendipity” was used multiple times throughout the day. The fact that we found a ceramic angel, upon which mom had written “The Sayres – 2007” was serendipitous. The fact that we called Larry and he was immediately available to come over was serendipitous. 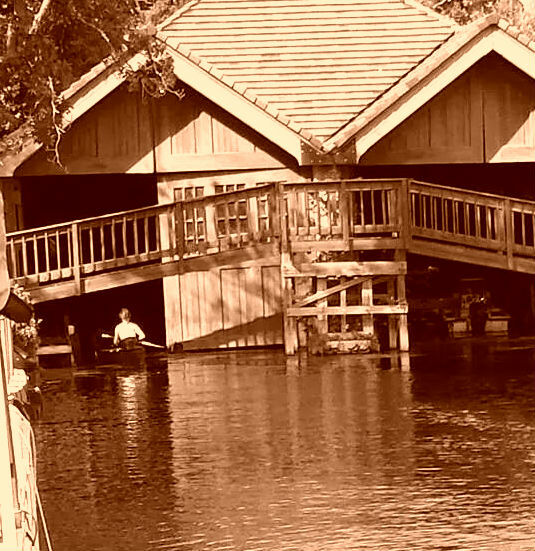 The fact that Larry and Nancy, along with their daughter Laura and her husband were, at that moment, in the middle of purchasing a lake cottage was…serendipitous. The fact that they needed furnishings for the cottage…almost the exact furnishings that dad could no longer use was…yep…serendipitous. Serendipity was a word my mom used a lot while were were growing up. I thought it was some 60’s thing the church had created to compete with groovy, far out, and alright to try and sound cool to teens. I don’t think I had used the word in a sentence in 40 years! When Larry (of) Sayre started using it, I was transported to another place and time. As I sat down to write this post, I went to Google to look up the definition. Little did I know I would be taken back a wee bit further than the 1960’s. I was taken back all the way to the 1750’s! 1754 to be exact, when Horace Walpole coined the term in a letter. He was describing a Persian Fairy Tale to his correspondent. The fairy tale? “The Three Princes of Serendip”. There are SO many layers here. Three Princes…(now, do you get the three Princes reference in my little fairy tale?? )…the Three Kings from biblical texts, one or all of whom could have been Persian…Persia, today’s Iran. I love when history does that to you…you go looking for one thing and you find another, far more powerful…it’s incredible, you might say…or rather, it’s serendipitous! It was a drive I had made countless times in my life, though it had been a few ye ars since I had visited. For me it had long been hallowed ground. Turning into the entrance brought back the same feeling…the feeling of entering a different place; the feeling of familiarity; the feeling of leaving the hustle and bustle behind (oddly enough, it is the same feeling I now get when I descend into the valley in which we live). This trip was different though, this trip had a purpose. Our family was gathering, my siblings, our kids, my nephews, our kid’s-kids. We were gathering from hundreds of miles away. We were gathering to celebrate my sister’s wedding. 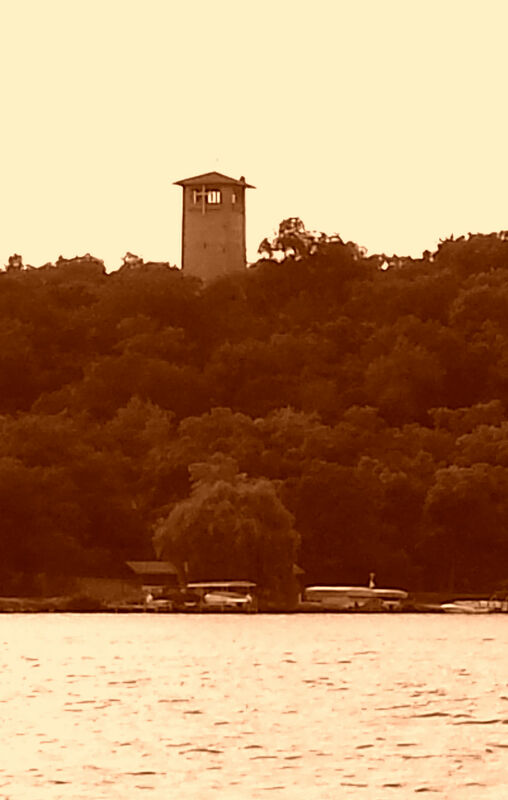 We were gathering to scatter my mother’s ashes along the lake shore she loved so. Green Lake, is a conference area located in Central Wisconsin, located on the shores of Green Lake, near the town of the same name. It’s official name is Green Lake Conference Center (we knew it as The American Baptist Assembly Grounds), to us, it was just Green Lake. As we drove down the main road, through the dappled sunlight, many of the changes since our last visit several years ago became apparent. Later, as we walked around the grounds, familiar spots seemed like shadows of days gone by. My brothers and sister and I grew up here, spending every summer vacation for years with our parents. We didn’t know until many years later the only reason we could even afford to stay at Green Lake was that my dad was actually working at the conferences. We were oblivious! In our younger days, we would spend our mornings (and parts of the afternoon) in the children’s programs, graduating from “door to door” each year. (Think vacation bible school with each age group in a different house, with a different color door). The afternoon’s activities included swimming, hiking, crafts and sports. Even before we came as children, mom and dad were coming to Green Lake. Recently, I found a wood-burning project dad had made in 1945 while at Green Lake. He would have been 15. I wonder, was he actually at Green Lake when World War II came to an end? Why did they come to these grounds? Because their parents came to these grounds. In the 60’s and early 70’s, Green Lake was a different place. It was bustling with activity. Hundreds of visitors each week. The front gate was manned by a guard, only allowing in the registered conference attendees, those there to play golf on the championship golf course, employees and a handful of folks that lived on the grounds. As children, it was safe for us to roam across the entire place. At night, our favorite activity was “deer hunting”. This involved piling four kids into a car, keeping them quiet, as my dad drove slowly through the overgrown gravel roads deep in the woods looking for deer. We would keep track each night of how many we spied. As we grew older, we were able to explore more and more of the grounds on our own. As the years went by, my older brother and sister got summer jobs, graduated high school and no longer vacationed with us. My younger brother and I continued to anticipate our annual excursions. Together we explored, roamed the grounds, made friends with other kids attending (especially, the cute girls-made it to second base for the first time at the top of one of the water towers on the property! ), and wreacked the typical havoc of two teenage boys. Somewhere during this time, we got word they we adding an additional 9 holes to the golf course. You see the conference center was struggling to make ends meet and the revenue generated by the course was key to keeping it afloat. Not being a golfer at the time, we were devastated! How many acres of our beautiful woods would be devoured by 9 holes of golf? Gone was Quarry Road, gone was Tower Road. All for a stupid game? Fast forward a few years, we were now grown, married, and had kids of our own. Being a young financially struggling family, we could not afford to go on vacation. When my parents invited us to join them at Green Lake for a week, we jumped at the chance. Soon, the annual trek was reignited. Each year mom and dad, all the siblings and their families would descend upon the hallowed grounds. At first, we all stayed in the same house. As our families grew, some of us would rent cabins, or stay in the camp grounds, but we would always spend time together throughout the week hiking, running, eating, and playing games. Mom would relish in the game of posing the JT and Brad’s stuffed animals while they were at the Children’s Center. It became quite a game to guess what Mimi had done with them now as we walked back to the cabin. That Pooh had many great adventures: playing board games, washing dishes, grilling out, watching TV, and playing tennis! During this time, we were to learn some well-kept secrets of parenthood (JT, Brad, Jeff, Ross and Kyle you cannot read this part until YOU visit Green Lake with YOUR children, so just skip to the next paragraph). Secret #1 – Vacationing at a locale with a Children’s Center with lots of activities for kids ROCKS for the parents too! Parental down time! Secret #2 – When hunting for deer, it is not necessary to be as quiet as church mice, but how else are you going to get four kids to stay quiet for an hour? We also discovered another secret – town! Yes, there was life away from the conference center. Before long, our annual treks had to include a meal or two at the Goose Blind Bar and Grill and Pizza Hut. We also included tours of the Rippin’ Good Cookies factory, the Amish bakeries and the various antique shops in the area. Who knew?!!? Green Lake announced plans to, once again, expand the Golf Course. We were disappointed to hear more of our dear woodlands would be plowed under, however, since I had taken up the game and Brad was learning to play as well, we were excited (with a tinge of guilt) to play the new nine. Soon, “The Woodlands” would become our favorite of the two courses on the grounds. By now, life had changed yet again and the annual trek fell by the wayside. Green Lake, always living from “paycheck to paycheck” was experiencing financially tough times. They began to sell more and more lots to private owners. It seems lake front property could garner a very high price! Our parents were now retired and spent three months a year volunteering at the Conference Center. 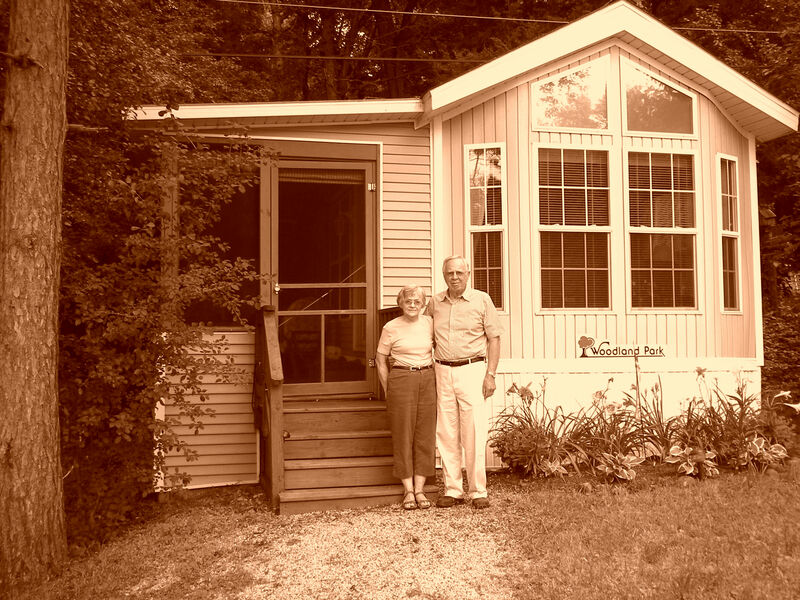 They purchased a modest mobile home and leased a spot in one of the mobile home parks on the property. Carmen and I made it point to drive up to visit, if even for a long weekend, many summers while they were there. For a time, we had a motor home (Clark, that there is an RRRR.V.!) and we would stay “right next door” in the extended lot they had leased. As mom and dad grew older, they decided to give up the trailer at Green Lake and sell it. During our final trip to visit, we learned the Conference Center was selling off the largest section of woodlands yet to a developer who would be building million dollar homes on the property, even the east gate would be removed to allow the homeowners easier access to the grounds and their homes. Shadows of days gone by…memories of simpler times…a lifetime (five lifetimes actually) of memories. There are still parts of the grounds that remain. 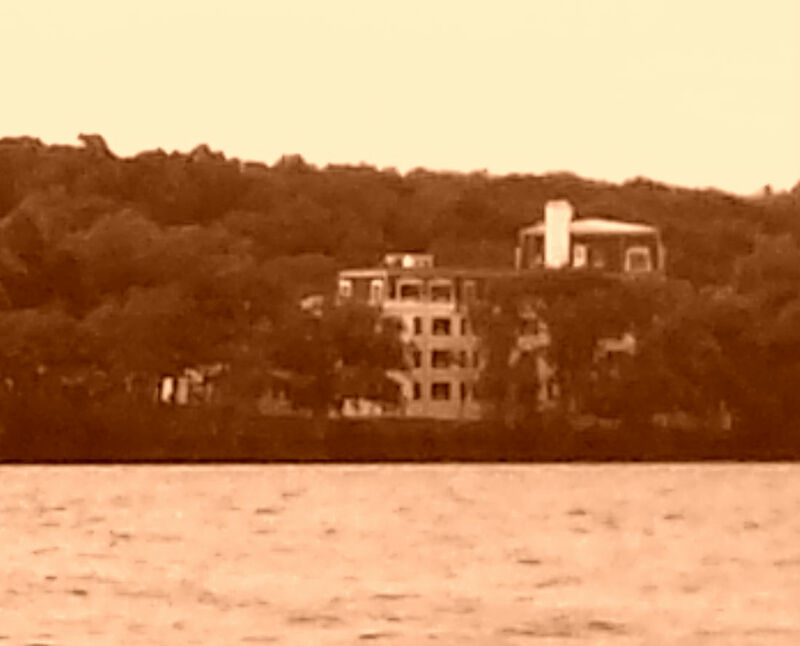 The grand hotel, Roger Williams Inn; Judson Tower standing guard; the boat house with it’s marina and docks; some of the cabins and houses; all can still be found. Call it the world we live in today, call it progress, call it competition for our attention and entertainment, call it what you will. I found myself saddened to walk the grounds and see the shadows. Much of what I remembered is “just ‘living memory’ that sadly no longer exists”. It was the Saturday before Christmas. Carmen and I had just collapsed on the couch in front of a roaring fire. 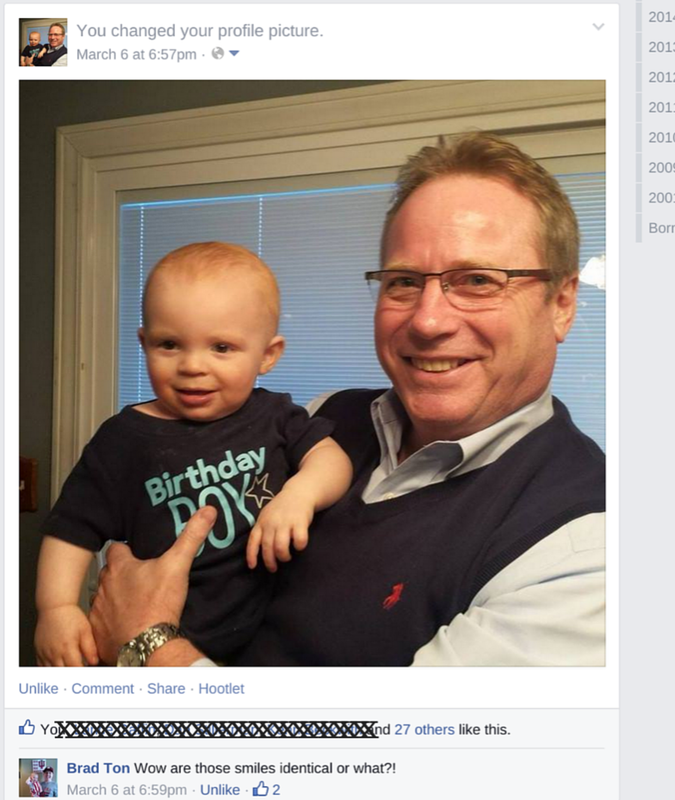 We had just celebrated Christmas with our two-year old Grandson Braxton, our son JT, and our parents. We had “just settled down for a long winter’s nap”, when just to my left there arose such a clatter…ok, it was my cell phone vibrating to alert me to a text message. It was from my sister, Jill. Within moments, my phone rang (or rather vibrated). As I entered the Christmas season this year, I became keenly aware of my mother’s absence. She passed away in July, 2013, but this year I have missed her anew so much. Mom was the tapestry of Christmas as I grew up and even as I was an adult with children. Mary Ellen, Mom, Mimi brought Christmas to life for her family and friends. She could do Santa magic, holding on to the Sear’s Christmas catalogue until after Thanksgiving for her children to dream Santa dreams that she knew they couldn’t afford. Yet, observing her, you knew how strongly she embraced the Christmas story of Jesus coming into the world. I was a PK, preacher’s kid, and was used to our family life reflecting the liturgy of the time of year. I didn’t appreciate as a child the impact our family rituals would have on me. This year, I have been looking for Mom. I wanted to experience her in the ornaments she and Dad had given us kid through the years. Dating back to 1973, they had given me an ornament each year, in keeping with the tradition given by Mom’s parents. My precious ornaments had been packed away for several years. Many circumstances in my life kept them from view until this year when my boxes had been moved to my new home. I unpacked the boxes of ornaments, hungry for a glimpse of my mother. I reminisced childhood Christmas memories with my new husband. 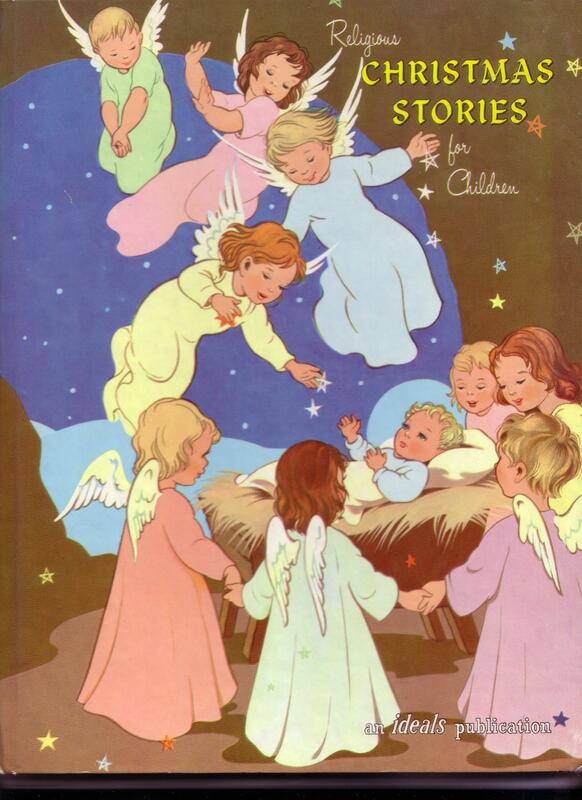 One strong memory was how my mother pulled four active children together many evenings during advent each year. Somehow she managed to slow us down enough to light the advent candles, read a scripture, read a story and perhaps even sing a song together. My initial memories of those times were how we kids fought over the honor of lighting a candle or reading a passage. My memory now is of a very patient mother who was determined to bring the light of Jesus’ birth to her children. And she did. I continued my search for my mother this Christmas. I wanted so badly to touch her, feel her, and embrace her. I thought about all the stories she read to us each year. “The Gift of the Magi”, “The Other Wiseman”, “Amahl and the Night Visitors” and “The Little Black Lamb”. My favorite for some reason was “The Little Black Lamb”. I remembered vividly sitting by my mother as she read the story and I looked at the drawings in the book. It was a very simple story. I poked around my saved books and found all of the stories, given to me by my parents in the early 70’s. All except “The Little Black Lamb”. As if on a mission, I went to Google to find that story. And I found it finally. Somebody had typed it up and posted it to their blog. No credits were given to the author, which I thought was sad. (for the record, the author is Emily S. McCracken). Jill’s gift was “finding” our mother…my gift was sharing the moment with my sister. 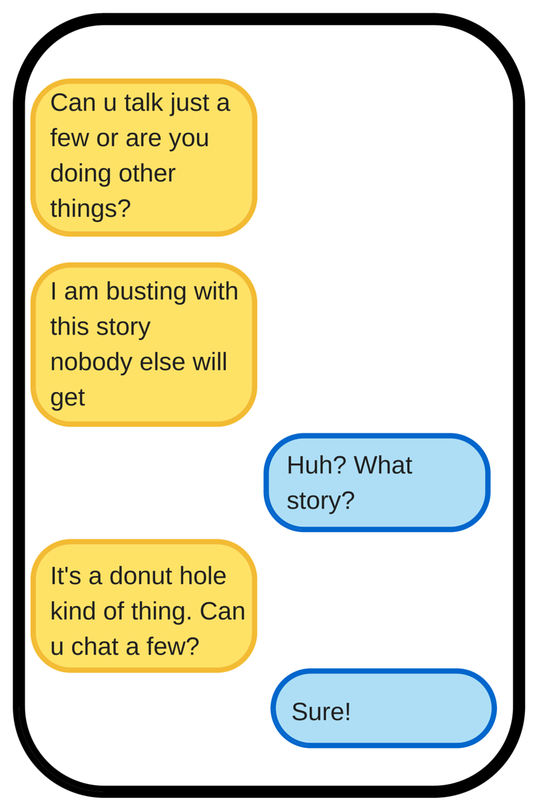 (The Donut Hole referenced by Jill’s text was a post in this blog). My mother was a closet Jesus Freak! I received an email a couple weeks ago from a dear friend, asking me in short, to write a devotional for an Advent Devotional Blog he was putting together (A devotional? Me? OK, quit laughing). He suggested I could use a previous blog post I had written about our Christmas Donut tradition, “Do This in Remembrance of Me”. I could update it with my thoughts of how the tradition might be different this year after mom’s passing. Coincidence Number 1: I explained to him I was already thinking of writing a post for my blog about a tradition we had when I was a kid so his timing was perfect. Believe it or not, mom and dad would get us up early on a Sunday morning (remember, my dad was the minister) before church each of the four Sundays of Advent so we could go carol (unannounced) for a family in the church and give them a gift. No, I am not kidding. For the full story check out “Maranatha, in this way, our Lord comes”. My friend thought that sounded like a great idea. My quest began. Quite honestly, the only thing I could remember was the chorus of the song we would sing, “Maranatha, maranatha, maranatha, Our Lord Come”. I needed more. I sent a note to my three siblings asking for their memories. Unfortunately, they remembered less than I did! I turned to the internet to try to find the song itself, which is where I hit Coincidence Number 2, or rather it hit me. After, reading the Wikipedia entry for “Maranatha”, I was intrigued to learn that Maranatha! Records was one of the first Christian rock record labels and part of the Jesus People movement. Returning to the Google search list, I clicked on the next entry, when WHAM! There on the page was a photo of a 1971 Time Magazine cover. The cover was a pixelated rendering of Jesus. The SAME pixelated rendering of Jesus that hung as a poster in my bedroom for years when I was a teenager. I even have a picture in a box someplace of myself sitting in front of that poster. The website described the Jesus People movement. In some circles they were referred to as Jesus Freaks. A label that was mean to be pejorative, but was later adopted by the movement itself. The movement had its roots in Berkeley, California. Further down on the page were some references to some of the founding musicians. In a minor coincidence (call it 2.5) , one of the artists listed was Larry Norman. At one point, I had all of his albums (for you youngsters those were 12 inch vinyl disks that had music on them). His logo eerily resembles my favorite rock band’s logo (an open mouth with a tongue hanging out…his has crosses on it though 🙂 ). Thinking I was getting close the song lyrics, I went to the website for Maranatha! Records and found the track listing for the first album produced. It was a collection of artists. There on the listing, was a song called “Maranatha”. Underscoring the fact that you can find anything on the internet, I found a recording of the song. BUUUUUZZZZZZZZ! Wrong song. Dismayed, I called dad to see if he could shed any light. Coincidence Number 3: Yes, he remembered. In fact, every Advent since 1972, my mom would pull the song lyrics out of her Advent folder, and the two of them would sing it during their daily devotional (they always did know how to party)! He was sure he could find it. I learned more about our Advent caroling from dad as well, but that is a different post. My younger brother was flying in for a visit from Dallas, so, I gave him the assignment of digging through mom’s folders and finding the song. In the meantime, I had lunch with the same dear friend who asked me to do the devotional in the first place. Coincidence Number 4: He and his wife were the first family we caroled to way back in 1972! As we talked, he remembered the gifts we gave them. One of them was a banner (my mom was the banner making queen back in the day). The banner simply said “Maranatha!”. I remembered that banner! It had a flying dove, carrying an olive branch in its beak! Coincidence Number 5: THE LOGO FOR MARANATHA! RECORDS WAS A FLYING DOVE WITH AN OLIVE BRANCH IN ITS BEAK! 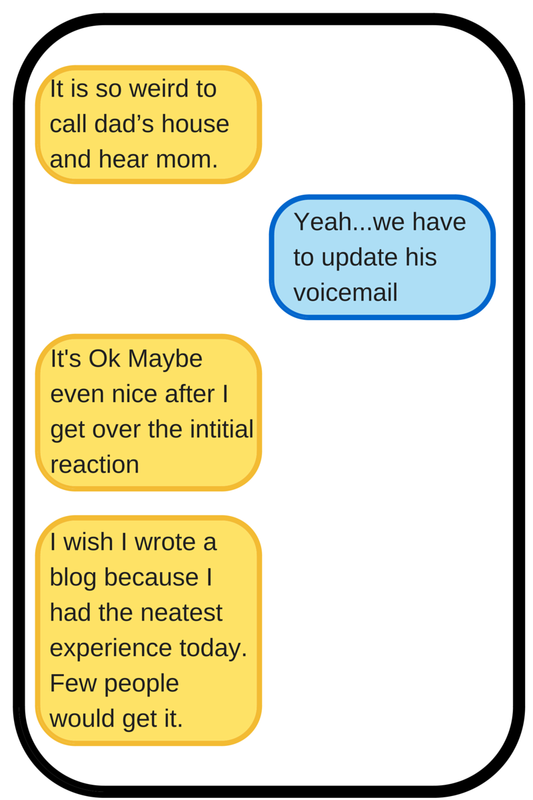 A few days later I received an email from my brother. He found the song! He sent me a scanned copy. I was ready! I knew I could get somewhere now! Armed with the true title “Come, Our Lord” and the composer, John Harrell, and the Copyright of John and Mary Harrell 1966. I went back to the internet. First the song…”BUUUUUZZZZZZZZ”!…you CAN’T find everything on the internet. A search on John Harrell also was fruitless…who knew there were so many people named John Harrell. OK, let’s try “John and Mary Harrell”. Boom BABY! There was a link to the online catalogue for the University of California and there I found Coincidence Number 6. John was an episcopalian minister and had donated a collection of the audio visual materials that he and Mary had developed over their lifetimes. Guess where John was in ministry in the late 60’s and the 70’s…Berkeley, California. For those of you not paying attention…that is where the Jesus Freak movement had its roots. Man, if Mom was not a Jesus Freak, she was at least following the movement! A day or two later, I received an email from my brother. Actually, it was a group email to all of the siblings, apologizing that it appeared the website he had chosen to host all of the family photos from Mom’s collection he was scanning did not allow downloads. What the heck does THIS have to do with the story, you ask? Patience, my dear reader, patience. I could not believe there was an online photo store that did not allow authorized users to download photos…especially, Flickr. I jumped over to a new tab went to Flickr, found my brothers share and promptly downloaded a picture. Humph! I knew it would work. About that time, I noticed an album titled “Jeff’s Box”. I had to take a moment and browse. I learned that not only were there photos, there were other documents. My commencement program from my high school graduation, my grade report from first semester of college (was THAT ever embarrassing to see! ), the program from my wedding to Carmen, and Coincidence Number 7. It was a scan of an article from the Newsette, the newsletter of the American Baptist Youth of Indiana. I was editor (which meant I wrote a lot of the articles) in the early 70’s. The title was “Very Special Gifts”. It talked about receiving a gift from my Mom on each Sunday of Advent! This had to be Christmas 1974. The gifts were meaningful, but it was the note she wrote on the first Sunday that caught my attention. “May your journey to Christmas be as this candle’s flame and as warm as its glow. Maranatha!”. THIS is where the second part of the tradition started…giving meaningful gifts and a note and each Sunday of the Advent season! Whether my Mom was a Jesus Freak or not, doesn’t really matter. What DOES matter I was reminded of next. The morning my Mom passed away, that same dear friend was by her side with the rest of the family. Taking some time of quiet reflection, he walked into their bedroom and began to look at the picture collage they had by the by the bed. Pictures of family, very old pictures of a young couple in love, but what was in the center is what caught his attention. It was a typewritten page with the words from a hymn, “Find Us Faithful”. It struck him so much, he read it at Mom’s Celebration Service. I barely heard the words. And yet, months later, in an email I was reminded and my journey of discovery was complete, or is it just starting? /jst/wp-content/uploads/2019/01/Jeffery_S_Ton_340x156_darkblue.png 0 0 Jeffrey Ton /jst/wp-content/uploads/2019/01/Jeffery_S_Ton_340x156_darkblue.png Jeffrey Ton2013-12-09 08:00:172019-02-15 16:46:20My Mother was a Jesus Freak!